The Peacock King Sutra (also known as the Mahamayuri Vidyarajni Sutra) is one of the three Buddhist classics used in chanting and prayer ceremonies for protection, blessing and disaster eradication. It is a powerful text that effectively responds to invocations. The sutra, however, after tantric Buddhism reached Japan during the Tang dynasty, was lost for a long time in the Mandarin-speaking China until the 1980s, when Venerable Master Chien Ju started to work assiduously for its revival. He later formed the Peacock King Lineage sangha out of Kaicheng Monastery of Taiwan, which he dedicated to propagating the Peacock King Sutra. 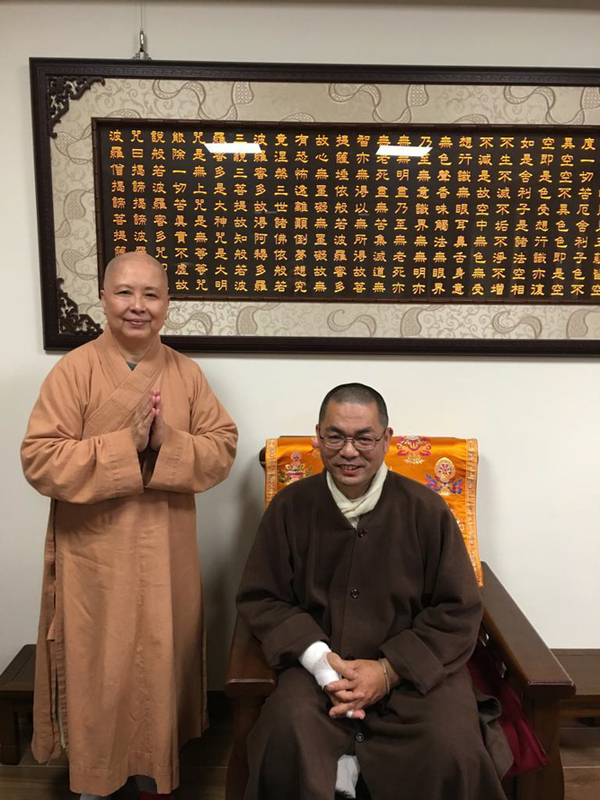 Venerable Shan Ci had the privilege to make the master’s acquaintance and receive his teachings. In March 2017, Yilan Peacock King Temple in Taiwan held a seven-day Peacock King Sutra Chanting Ceremony. While attending the event, she had an opportunity to interview temple abbot Venerable Tzu Chieh. Venerable Shan Ci: In his old age, you followed Venerable Master Chien Ju around while studying under him. Are you aware of the hardships the master went through in propagating the Peacock King Sutra? Venerable Tzu Chieh: When he got started it wasn’t easy, because few people then understood it. He was able to locate it in the Buddhist Canon, but the problem was that the text was unedited with no paragraphing and it contained a lot of mantras. Luckily, through someone else the master got acquainted with Professor Chuang Hsiching, who provided a transliteration of its Sanskrit. Afterwards, Professor Lin Kuangming did a revision, which produced the text that the Mount Peacock sangha uses today. The master often talked about the obstacles he encountered in these early days. For example, the mantras in this sutra were long and hard to chant. At the time he was plodding along almost single-handedly. But as he said, no matter how many people he could work with, he had to move on, and he always held onto this conviction. As for the cultivation as a Buddhist, of course, he said that it is important to stick to a plan and not let your mind waver when either more or fewer people come to work with you in your team. Why? Say you are happy when you have many people working in the team, but when there are few, you want to wrap up quickly, right? But that is absolute unacceptable. He always said that when sentient beings are joyful, the Buddhas are joyful, and when the Buddhas are joyful, the guardian devas and nagas are even more joyful. Just now we mentioned his old age. Every time the master travelled, members of the sangha would follow him spreading the Dharma at home or abroad. By that time the master’s chanting was perhaps not as vigorous as in his younger days, but when you look at the teachings that he gave, question anything about the Peacock King Sutra, and at once his spirit would be fully piqued. He always spoke about the various aspects of the Sutra, and spared no effort since becoming a monk and studying the sutra. Venerable Shan Ci: What, then, should be our goal and purpose for studying this sutra? Venerable Tzu Chieh: Basically, to help remove barriers and accumulate merits. In its prayers the sutra talks about making a Bodhicitta commitment, and that includes your motivation, purpose and major goal. It says that the collective study we do today is not to seek reward and fortune, or even Pratyekabuddhayāna, but for the supreme vehicle, to attain anuttara-samyak-sambodhi or Buddhahood, together with other sentient beings. That should be the major goal in studying this sutra. That of course is for the long term. And for the present, we should also talk about the merits and benefits it brings us now. In terms of our own practice, we may have insufficient virtue, or illnesses, among which the lack of a healthy body is a big obstacle that makes us suffer, as you do have to be physically healthy in order to bring a robust cultivation. When the sutra refers to sickness, it lists all the eight guardian devas and nagas and other guardian deities. Within the Peacock King Mandala, we see that the care the Buddhas and Bodhisattvas administer is indeed very compassionate. The strength you get from your cultivation by chanting the Peacock King Sutra enables you to transform an obstacle created by an external factor into a kind of Sambhara or meritorious virtue, something no longer hostile or even obliterating. The sutra speaks about ideas and thoughts. If someone loathes you, then how do you turn him into a friend and not an enemy? The key is to change his ideation. In the Peacock King Sutra, we see many kinds of ghosts in different categories. Their names and ways of dealing with the injuries they bring are all different. The resulting karma is in sufferings such as toothache, headache, and all kinds of pain or barrier. If we are sick, naturally the four constituent elements of earth, water, fire and wind within our body are out of tune. Add to it the environment, impact of the weather, non-human disturbances and karma. Each time you chant the names of these guardian deities, you receive strength and protection. Venerable Shan Ci: So chanting the Peacock King Sutra enables one to transform their thoughts and through doing that, change their karma. Venerable Tzu Chieh: And from another angle, it may be mitigation of a severe recompense in karma. The key is, of course, we cannot immediately rid ourselves of bad karma. Since you have made it, you will have to bear it and accept it. Say if I curse at you or beat you up, I have to pay for it, don’t I? Some may say oh it doesn’t matter. But then does the karma disappear? That is just a matter of a proper recompense or a mitigated one, but the karma is still there, and that is what the sutra says. Maybe you deserve a death penalty, but you might get only a minor injury, or a minor injury commuted to a bruise, or else a bruise reduced to a mere feeling of horror. These are all mitigations of a severe recompense, where the change happens naturally. For all faithfuls the goal is to become a Buddhist and make a Bodhicitta commitment. For the here and now, following the Peacock King Sutra yields a worldly benefit. After your life ends, you naturally hope to go to pureland, ultimately wishing to attain enlightenment like Buddha. But the master said that the Peacock King would be a plus for us. If in the meantime we chant Buddha’s holy name, recite other sutras or meditate, it has an added effect, although of course not replacing them. As I cultivate for prajna, there is already Amitabha Buddha’s compassion. Yet why do I still have so many obstacles, like getting sick etc? It is not that the Buddha is not compassionate. As all humans are bound by karma, you have to admit that there is a phenomenon called disturbance. Since the Peacock King Sutra has such a great capacity, whether to eliminate anxiety, remove obstacles, or at least provide mitigation for a severe retribution so we are able to transform, why don’t we make use of the karma this privilege affords us to dedicate its merits to those bringing us to pureland? From this point of view, the Peacock King Sutra is an added blessing, because if we talk about the elimination of anxiety, there are not only sufferings from illnesses, obstacles and non-human disturbances, but also the issue of area of enchantment. None of the reasons for any of them can be ignored. So for one’s practice in the present world, there is this removal of obstacles and accumulation of merits as we mentioned. And in the long run, it does not take away from one’s ultimate goal of attaining Buddhahood but serves as an added blessing, and even if you don’t follow the Peacock King Sutra, you chant Buddha’s holy name, recite other sutras or meditate, it poses no detraction. Venerable Shan Ci: Compared to other tantric Buddhist sutras, how unique is the Peacock King Sutra? Venerable Tzu Chieh: For sure the Peacock King Sutra can be considered part of tantric Buddhism. Someone asked me: Venerable, should it be taught to one only after taking abhisesa empowerment? Should we not chant it without taking abhiseca initiation first? Here, we can view it from two angles. The first one is about its reciting version, where it does not talk about not chanting it without inheriting it from a teacher. In fact, in the “Circulation” section in Volume III, The Great One told Ananda explicitly that you are to widely circulate the sutra, whether to a king, a courtier, an upasika or another member of the fourfold assembly of the Buddhist community. From this perspective, it should be widely spread. However, in the tantric tradition, according to its rituals, the Peacock King Sutra does need oral transmission from a teacher before it can be studied. In addition, the Peacock King Sutra imparts the Dharma through phonology. With chanting, it mesmerizes sentient beings in their cultivation by virtue of sound. Many lay practitioners say that they cannot chant the mantras, but they simply love hearing them. Venerable Shan Ci: Then what method of practice should we follow to get the maximum benefit? Venerable Tzu Chieh: If you really do want to get benefits, you have to work. Design a course schedule and line up specific assignments for yourself. Chant half a volume every day, or a few mantras, and you must do solid homework on the mantras themselves. Venerable Shan Ci: It needs solid work, and it takes time. Venerable Tzu Chieh: Right! It takes time. Venerable Shan Ci: Should we study it on our own or do it in a group? Venerable Tzu Chieh: You can do either. Of course, it is better to do it in a group, but self-study also works, and then even if at home you can still study it by yourself. Venerable Shan Ci: I heard that this sutra is not that easy for self-study, unless you have sufficient karma? Venerable Tzu Chieh: Given enough faith, it should not be difficult. As to self-study or co-cultivation, many Bodhisattvas do study it by themselves. Yet if you haven’t had the karma of co-cultivation, how do you go about doing it on your own? Suppose we did not have the benefit of the master’s teachings today, it would be very difficult to study it by yourself. This is not about the difference between self-study and co-cultivation. Rather, if there is karma for co-cultivation, then we should help make it happen. Having studied it in a group, you may then go back home to do some self-study as a follow-up. The two methods complement each other. Venerable Shan Ci: I remember the master used to emphasize that it would be best to spread the sutra around the world. He made it clear this was his wish. If there is karma to spread it in Canada, what should we do? Venerable Tzu Chieh: At present, the Peacock King Sutra is already quite popular in Indonesia, Malaysia, Singapore, and the rest of Southeast Asia. Of course, this is mainly among the Chinese populations, with their homogeneous language and cultural background. Indeed, such karma is quite exceptional. As for spreading it in Canada, we say that as everything has its karmic cause, let us root for this one with the International Buddhist Temple. It doesn’t matter how far it may reach in the future, as long as we’ve tried our best. By this I mean that today I am focussing on introducing the sutra, and we don’t need to worry about how many people it reaches down the road. Everything needs a karmic cause to trigger, and as far as our meeting today is concerned, we already have a sufficient one. Doing our best means presenting this karmic cause through a chanting ceremony, or interpreting its content, so it wouldn’t give us too much pressure, right? Venerable Shan Ci: Right. What’s next for your temple? Venerable Tzu Chieh: The Mount Peacock sangha focuses on the promotion of the Peacock King Sutra. I hope to see one day when, in the ritual of the sutra, a combination of the sutra text and the ritual procedure, so after sutra chanting there will be a part transitioning to the ritual. Within the ritual there is a part for oral transmission that the master once taught, which is complementary but not separate. This is to let the public know that there is a ritual in addition to chanting, and the two are parts of one. For otherwise, it would be split into two, the abhiseca is one part, and chanting is another. If there is such an opportunity, we should combine the two and let the public study it together. Venerable Shan Ci: That means satisfying the needs of the faithful as much as possible, and complementing the sutra with a transition to the ritual. 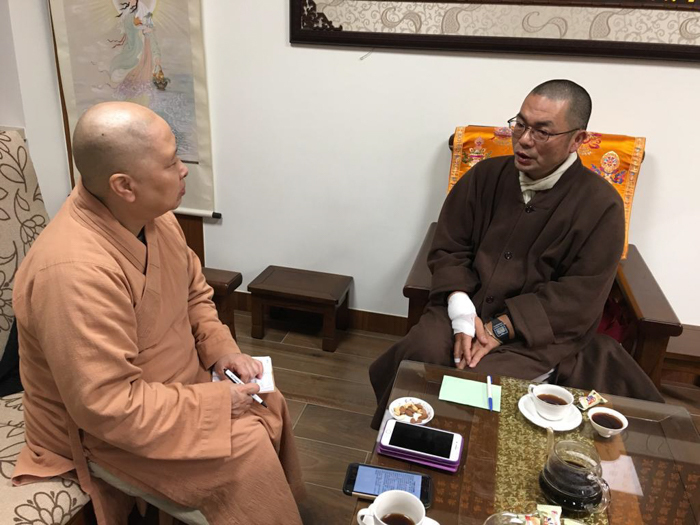 Venerable, I am so grateful to you for giving me this interview with your busy schedule, to help us better appreciate what’s so unique about the Peacock King Sutra. Members of my four-fold assembly at the International Buddhist Temple in Vancouver are all eagerly awaiting a visit by your Mount Peacock sangha to host the solemn Peacock King Sutra Chanting and Prayer Ceremony. It would be a great blessing for us all who follow Buddhism in North America.